Sometimes wearing glasses every day can be bothering. They become a part of you, cos you can't do anything without them, but in the meantime, they can be felt as heavy and leave marks on your face. If you go to your doctor and he says you are able to wear contact lenses you are thrilled, so you finally can see your face in the mirror as is. Glasses also cover your pretty eye color, which you can show up more with a pair of contact lenses. I found a cool shop online, where I can order my lenses and receive them directly at home, without having to go to the optician. Contactlenses.co.uk is an online store where you can find valuable contact lenses at a reasonable price. They dispatch to over 65 countries, so you can reach out pretty much wherever in the world you are located. Their lenses are from the most famous brands, like Acuvue, Ciba Vision, Johnson & Johnson, Crystal and more. You can pick up any prescription, whether you are astigmatic or shortsighted or need multifocal lens; daily or monthly disposable and even continuous wear ones; clear or colored. For all tastes and needs. I received 2 boxes of the Crystal 1 Day Contact Lenses, 30 lenses per box because I have different prescriptions from eye to eye, for the price of £7.25 per box + £6.32 International Delivery. The 1 day disposable lenses are the best because the most healthy and safe, as you only use them once and then toss them away. Be sure you do not over-wear your lenses for too long or reuse the daily ones, as they are less proteic than the monthly ones, resulting in much more discomfort if worn for an extended period of time. 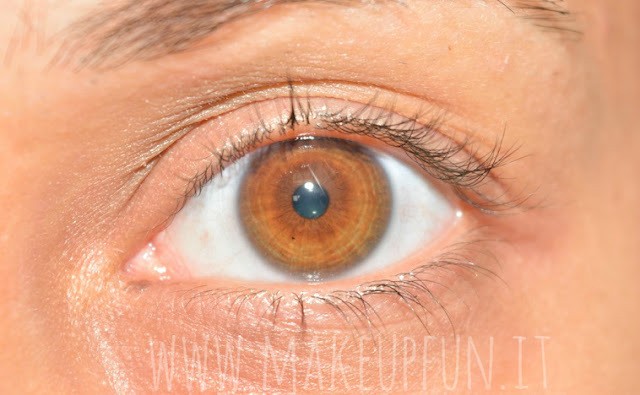 As you can see the lens are almost invisible on the eyes, showing off your eye color without being noticed. They result being very subtle and thin and clear as your eyes require, for the maximum blendability. The vision with them on is crystal clear and the prescription is right. I found myself very happy of this choice. They are moisturized for all day comfort and give a UVA&UVB protection. Also CE and ISO certified, for the best quality and performance. I really like these lenses because their comfort is as I've never tried before with other lenses, which became dull over time using them, and made me blink like I had some sort of nevrotic tic. I find these ones more wearable and soft than others, much less annoying when on. Good value for money and they're easy to open too. You can find explanatory descriptions for everything you need on their website. Look for your right pair of lenses today! Where do you usually buy your contact lenses? Let me know! My brother uses the same brand:) Looks like they are a good company. I don't wear contacts but so many of my family do and I will definitely tell them about this site, thank you! Really good prices! I don't wear contacts, but I find it silly that contacts can be so expensive!